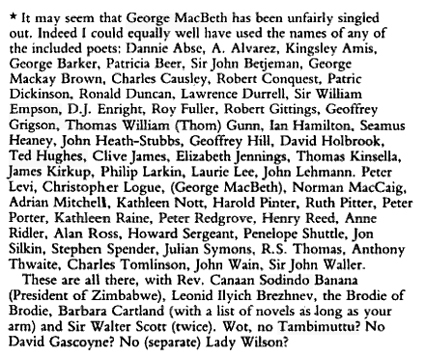 Let us take note of this footnote to a Gavin Ewart poem. Ewart (1916-1995) is known around these parts for his frequent comparison to Reed  Ewart's contemporary  particularly for his Second World War poem, "The Bofors A.A. Gun." your nameis it really a good dropping one? by more than two now! I am particularly fond of the sequence "Pinter Pitter Porter," which I think transforms the footnote into a sort of list poem, and makes it an integral part of Ewart's ode. Reed seems to have become equally disenchanted with his appearance in Who's Who: he was first added to the rolls as early as 1952, but his 1977 entry contains his personal revisions to his bio and publications.